If you have peanut or cilantro allergies, I would not recommend a visit to Taiwan. Crushed, pulverized, peanut powder is liberally sprinkled on many dishes, both savory and sweet, and cilantro is a common garnish on soups and savory dishes. 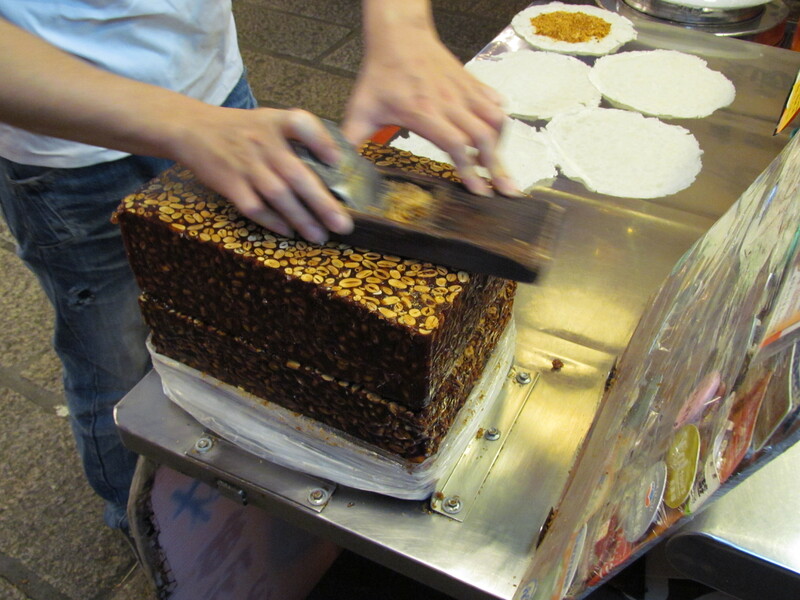 Here, a vendor scrapes a solid cake of peanut-studded sugar to prepare a sweet snack. Jiufen (nine portions) is a gold rush town with an old-style street. In addition to being the shooting location for Hou Hsiao-Hsien’s A City of Sadness, Jiufen is wildly popular with young Japanese and Korean tourists for its depiction in Hayao Miyazaki’s Spirited Away. 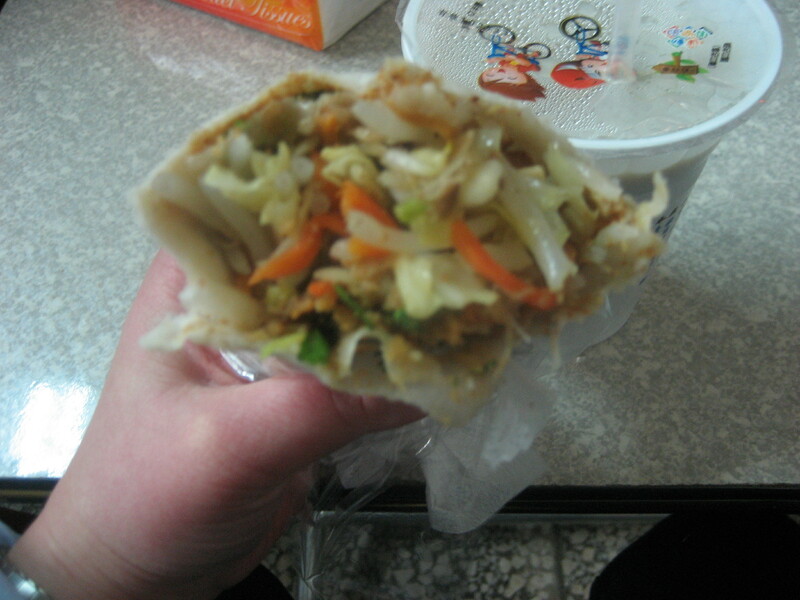 This thin rice pancake with fresh peanut shavings and two scoops of a light vanilla sorbet rolled up like a burrito (35 NTD < $1.20 US) had a good crunch. I washed it down with a fresh almond milk. 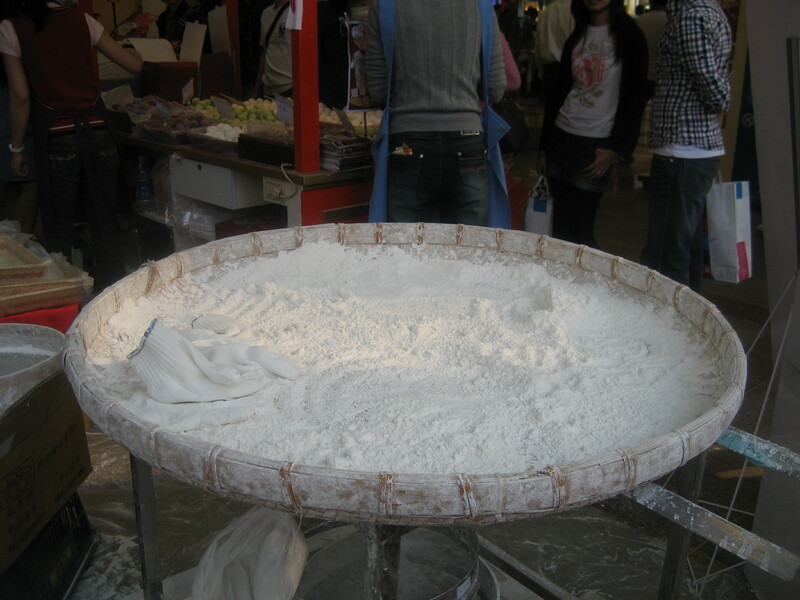 In many markets, the aroma of ground almond powder is intoxicating. I didn’t buy any, though, because it doesn’t keep well after it’s processed. A few days later, for breakfast, we had similar rice pancakes smeared with shaved peanut and cilantro and stuffed with shredded vegetables, bean sprouts, and a little bit of shredded chicken. I recall that this also cost approximately $1US. 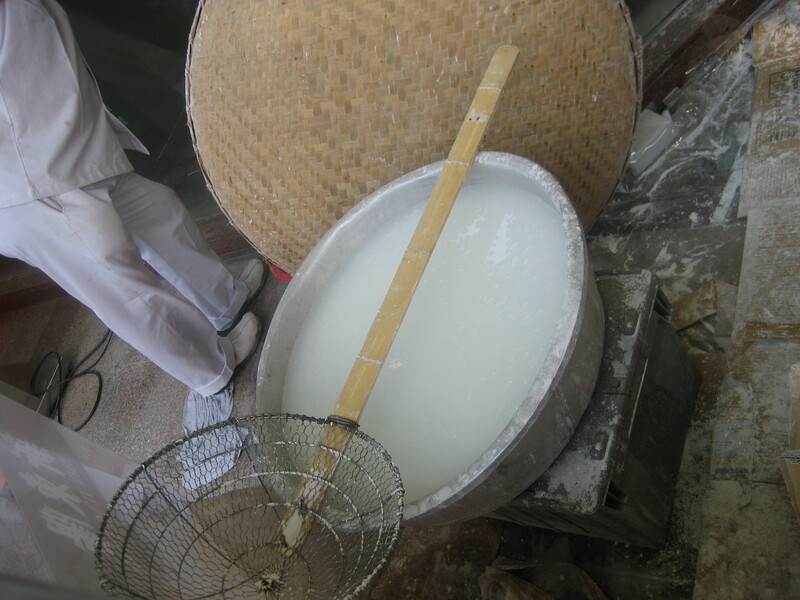 In Taiwanese, this is called a roong byang! (no idea how it’s actually spelled, and I included the exclamation point to emphasize the accent on the second syllable) and we think it’s comparable to South Indian dosas. 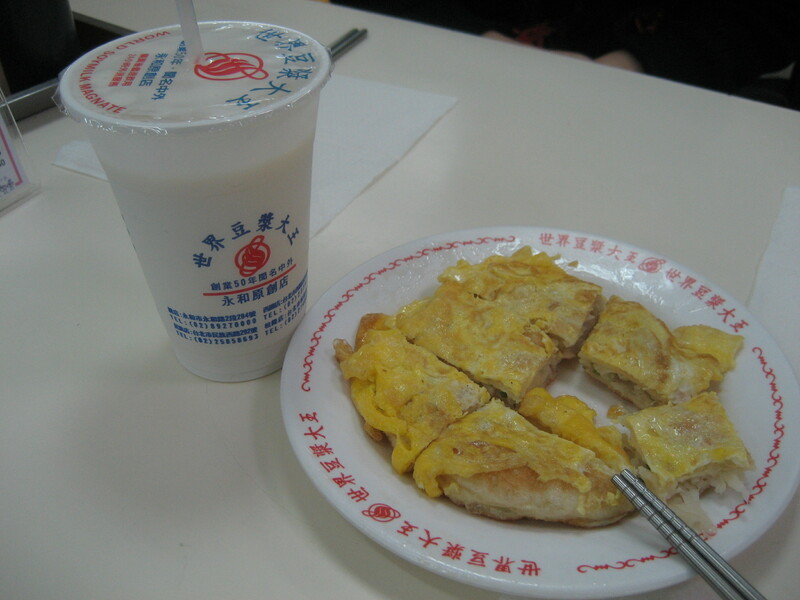 Most people were buying these to-go, but we sat and enjoyed them with hot soy milk. The stand was at a market near my family’s house. 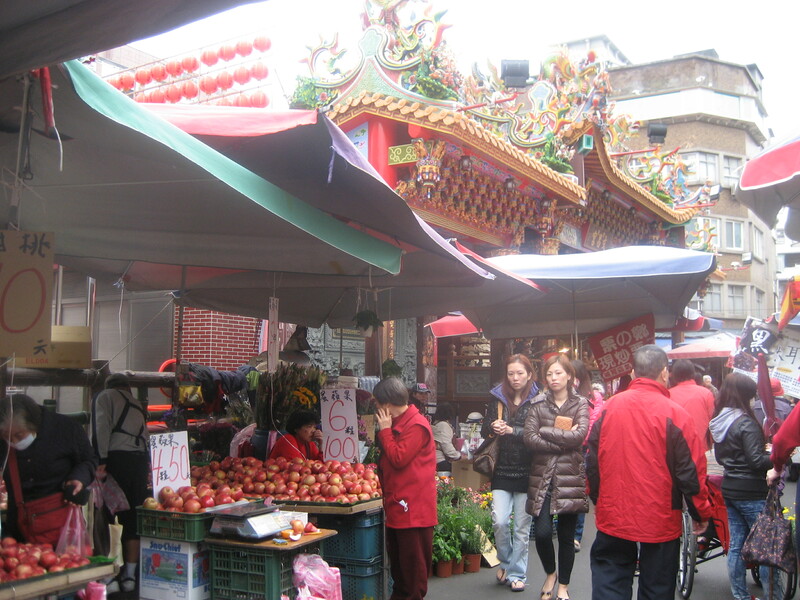 Despite Taiwan’s modernity and availability of European-style groceries, to say nothing of 24-hour convenience stores (more about these in a future post), many people still do their daily food shopping at markets like these, often outside temples. These open-air markets sell everything from produce, fish, meat, and flowers to kitchenware and underwear. 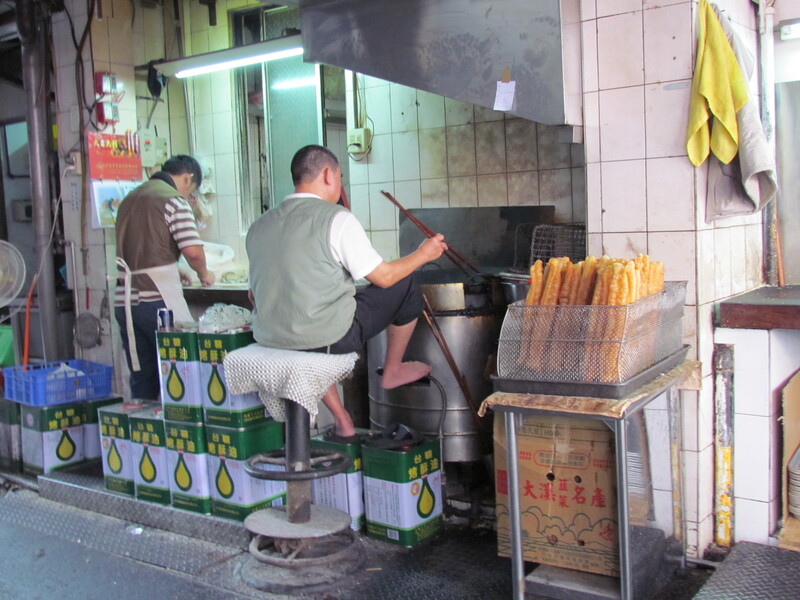 More on peanuts–and cilantro–in an upcoming post on a very Taiwanese street snack. The original temple was built in the 1730s but has been rebuilt multiple times after natural disasters, fires, and air raids. The current temple is a postwar recreation. 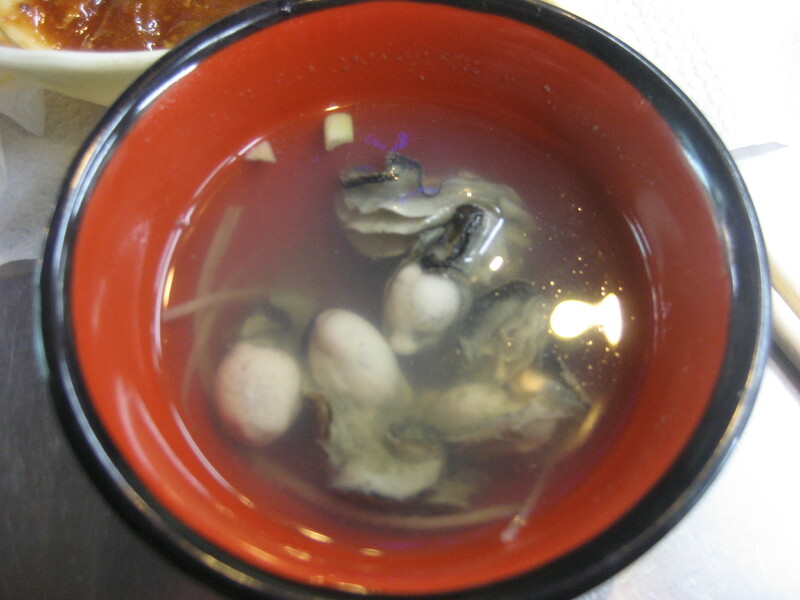 We ate oa geng (oyster soup), a light soup with plenty of fresh, sizable oysters. 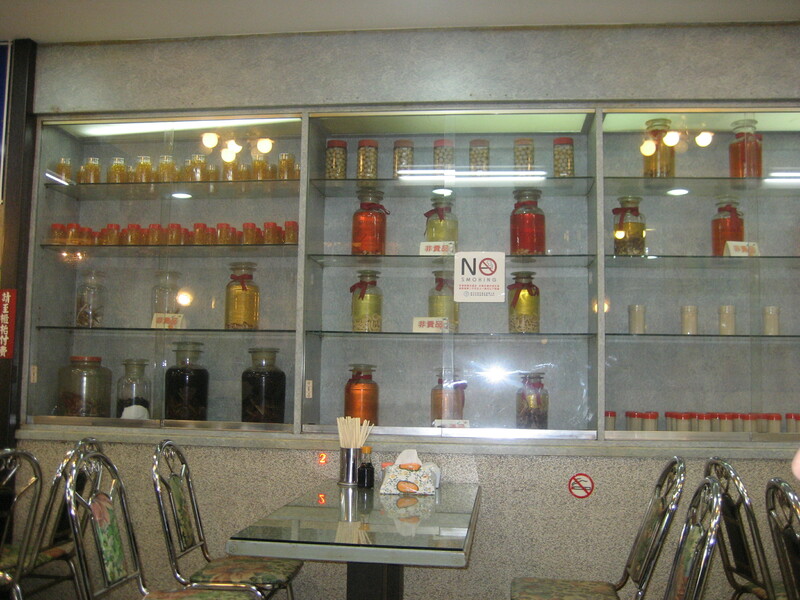 Other snake restaurants, not this one, had gigantic snakes and tanks of huge rabbits and rats (food for the snakes—so I guess one is indirectly eating rodents when one eats snake). No pictures allowed, because they probably don’t like being a tourist anomaly or attracting the attention of animal rightists. Snake is kind of a pain to eat. It tastes like bland fish. Too many bones, most of them intercrossing. 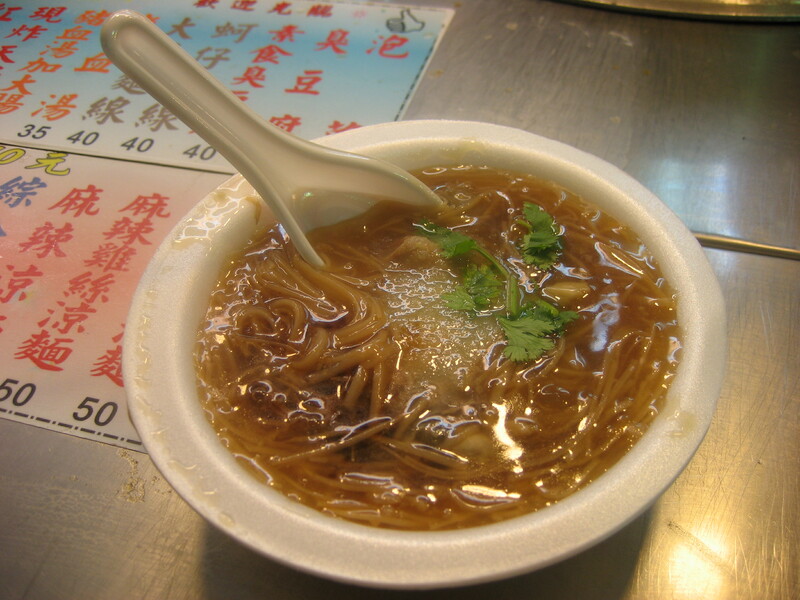 The broth was very good, light and a bit sweet, with Chinese herbs in it. 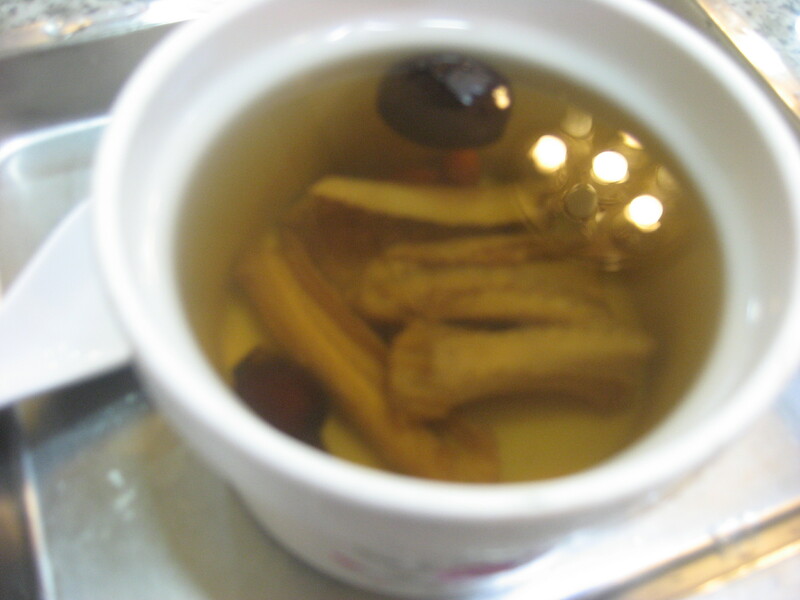 Snake soup is supposed to be good for ocular health (glaucoma) and skin (people here love to eat things they believe are “good for your skin”). Within ninety minutes of touching down at Taoyuan Airport, I was once again at Yong He Soymilk Magnate. 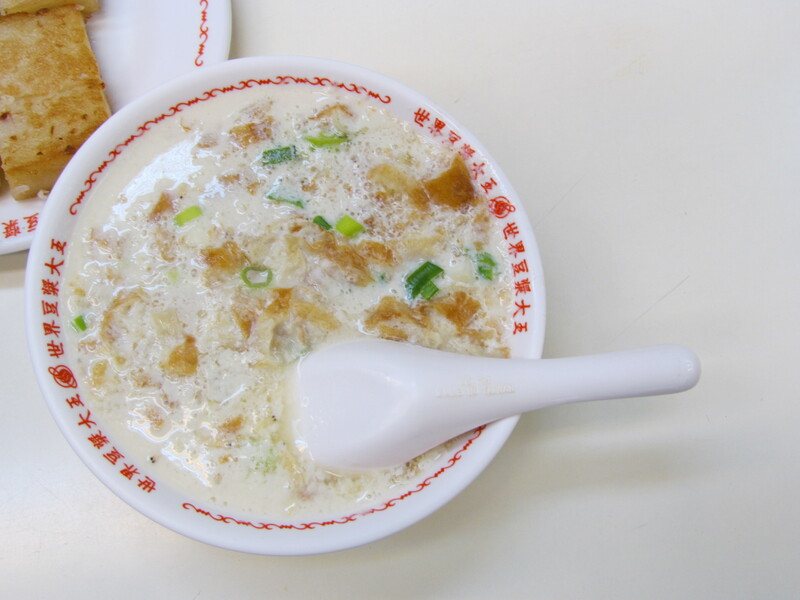 My mom’s warm savory soymilk with cut up pieces of yu tiao (fried dough stick) and scallions. I prefer sweet soymilk, hot or cold, depending on the weather (which, on this trip, has ranged from cool high 50s to a sticky mid 80s). Just some of our post-flight breakfast spread. Each item cost between 15-50 NTD, so everything under $2US. 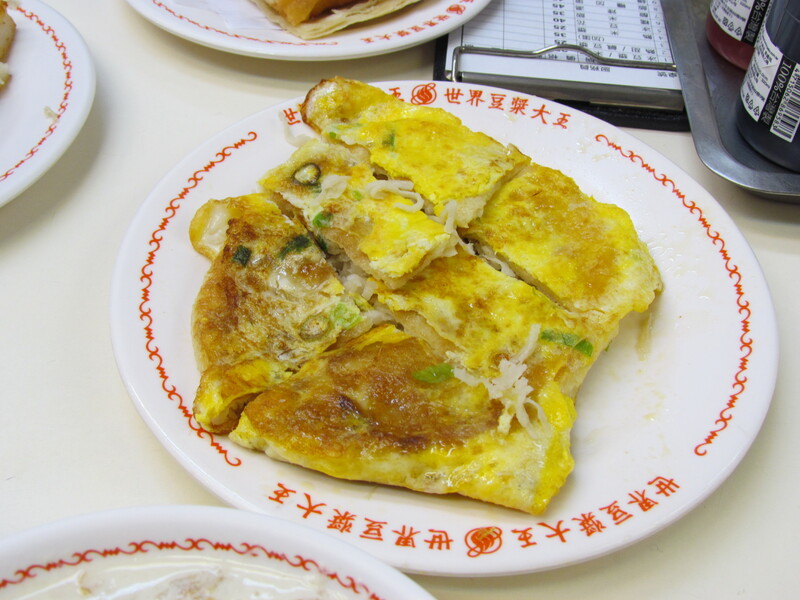 A closer look at the shredded radish omelette. 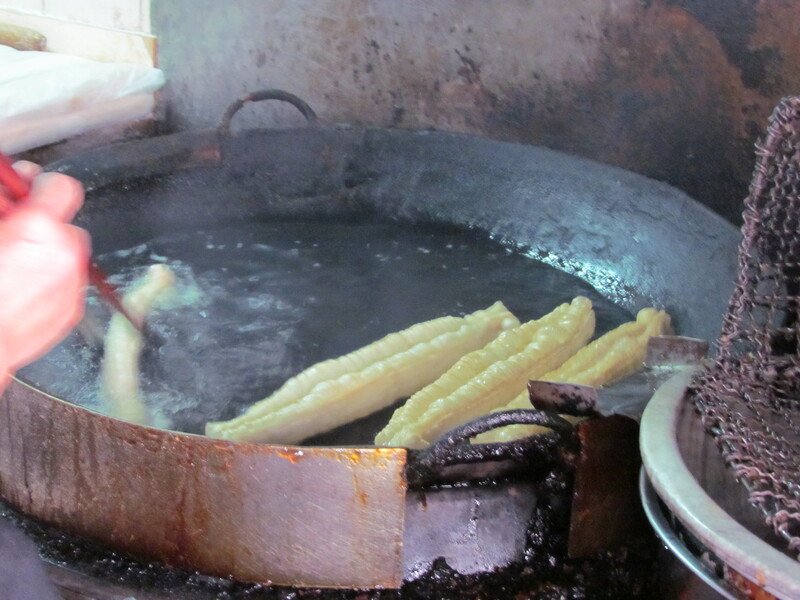 And a closer look at the fried dough-making process. They do this outdoors for a large grab-and-go breakfast clientele. 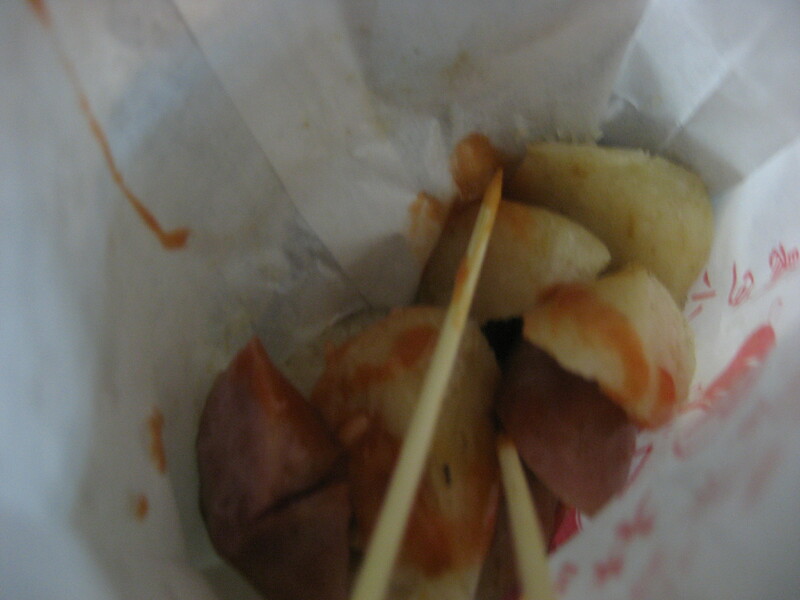 Look at how small the dough sticks are before they puff up in the hot oil. 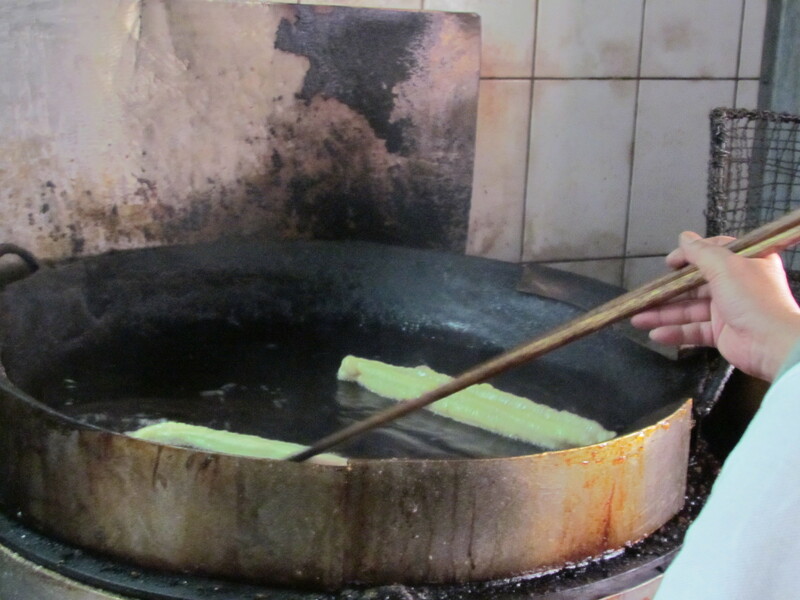 Note the extra-long cooking chopsticks and the prodigious amount of oil. I’ll be posting more in the days to come on night markets, things in edible wrappers, and food on sticks. I was in Taiwan at the end of the Lunar New Year celebrations, which ended with Yuanshiao Jie, the week-long Lantern Festival. This year, Yuanshiao, the first full moon of the new lunar year, was February 28, my last full day in Taiwan. 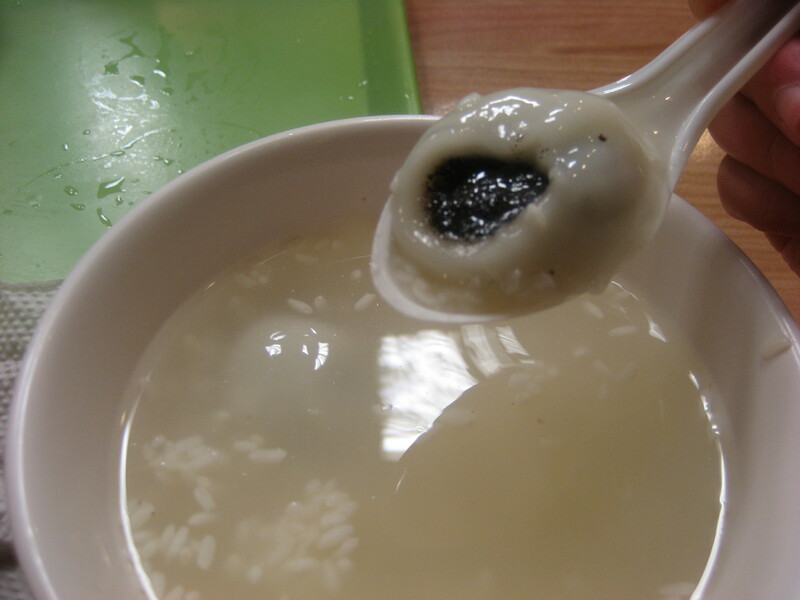 The traditional food eaten for Yuanshiao Jie is tang yuan, balls of glutinous rice in broth. This was my first time eating tang yuan with filling—as a child, my paternal grandmother and I just made the plain small ones (yes, I realize that they are small round things, but playing with dough was fun.) Most commonly, tang yuan are filled with sweet black sesame, sweet peanuts, or the ubiquitous red bean paste, but there are also savory versions with meat. 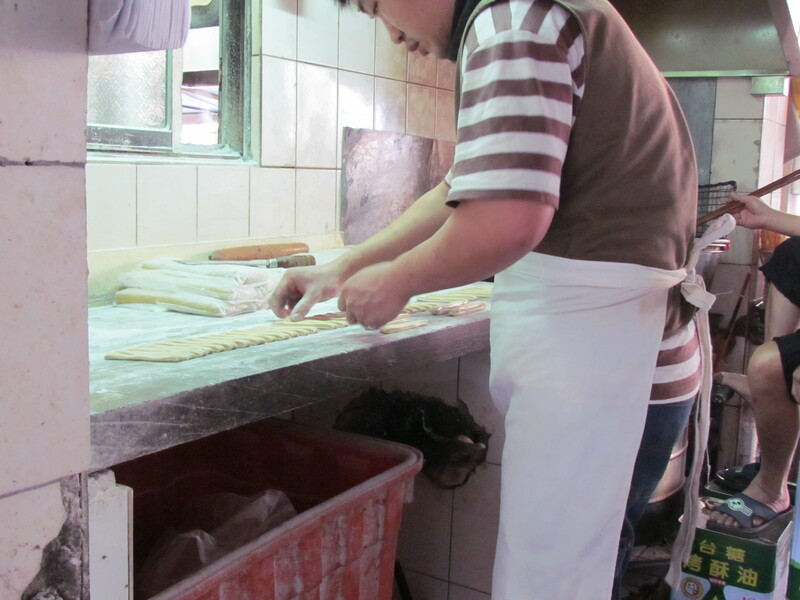 Making filled tang yuan seems rather labor-intensive. 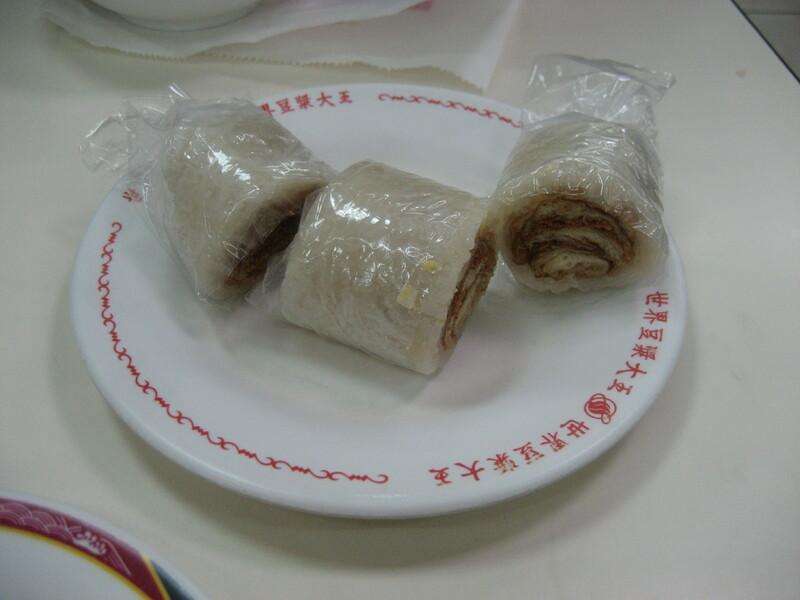 Balls of filling are alternately rolled in rice powder, moistened, and rolled in powder again, repeatedly building up layers of chewy dough around the filling. 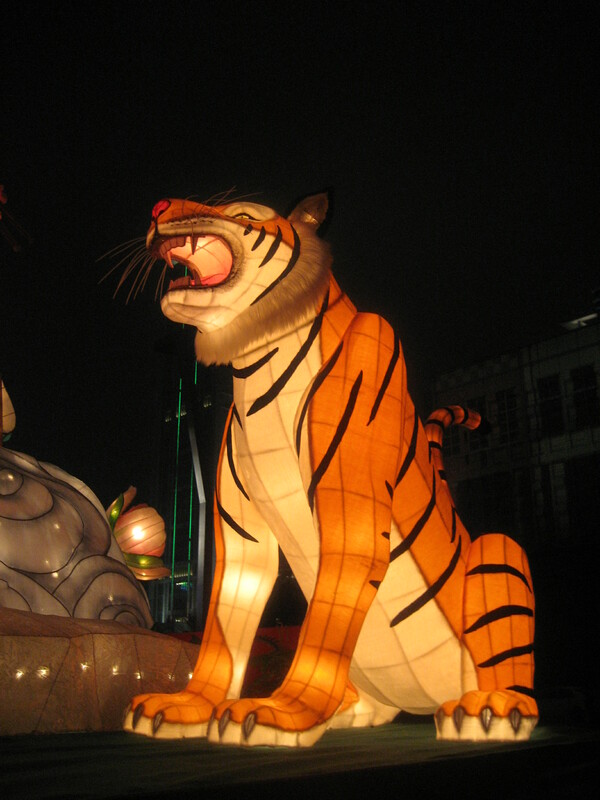 After finishing our tang yuan, my relatives and I went to the Lantern Festival near Taipei City Hall. I also ate a lot of fruit while in Taiwan. There is nothing uniquely Taiwanese or particularly exotic about any of them, but they were all new to me. It’s wax apple season right now. 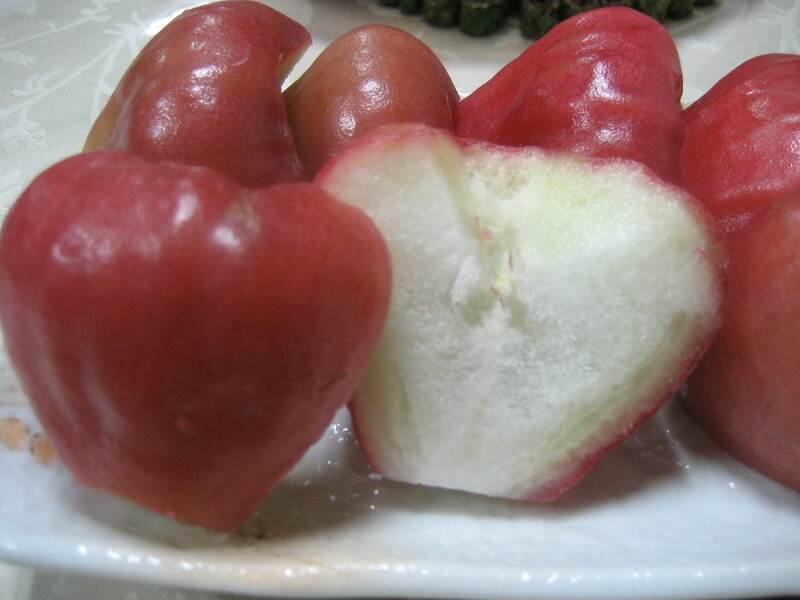 Known in Chinese as lian wu, they’re called “wax apples” in English because of their appearance. 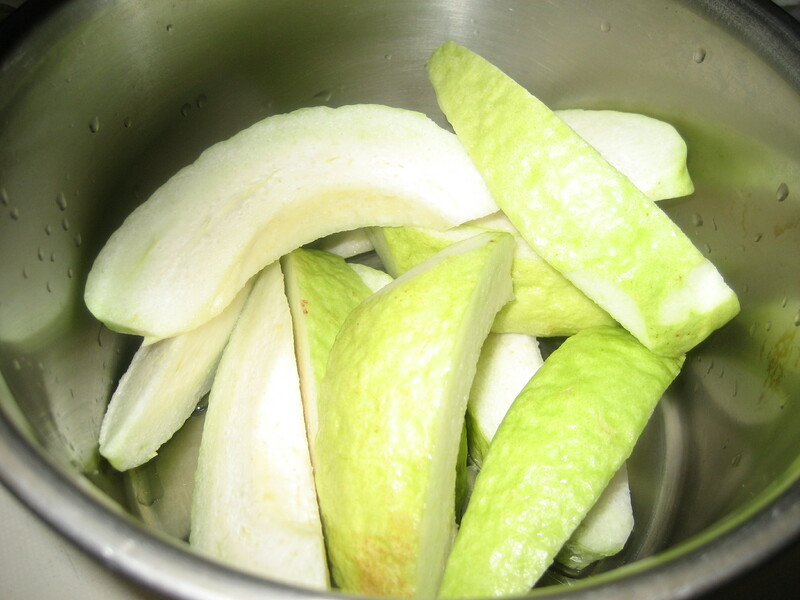 As far as taste and texture, they’re comparable to Asian pears, a bit tarter, with the crispness of airy Styrofoam. The best new fruit experience were these Buddha head fruits, so-called because of their resemblance to depictions of the Sakyamuni Buddha’s hair. 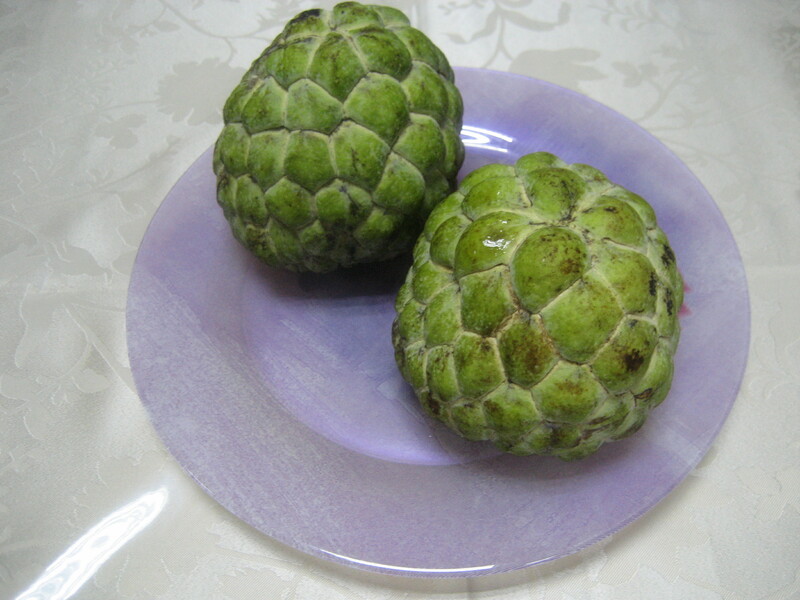 Eaten with a spoon, the fruit is creamy and sweet (hence the English name, custard apple) and contains hard seed pods like those of a lychee. 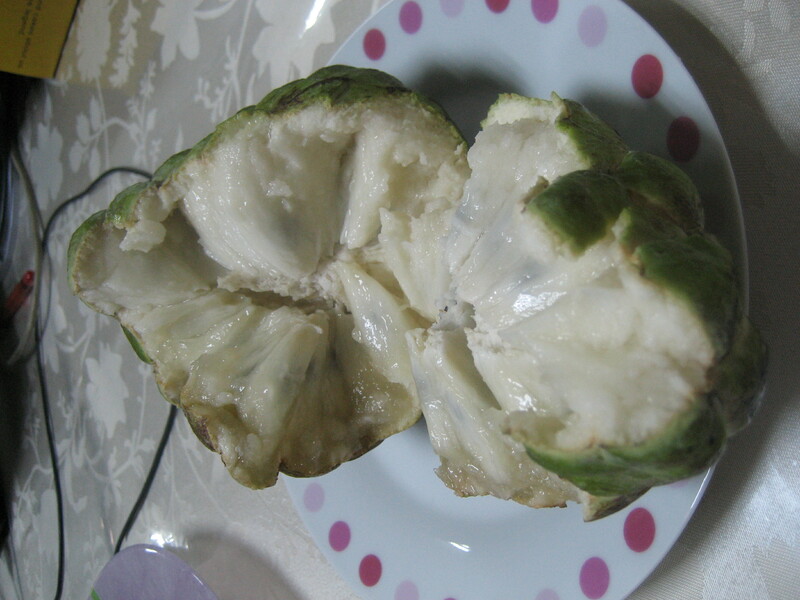 Some people find this fruit almost sickly sweet, but not as much as a durian. 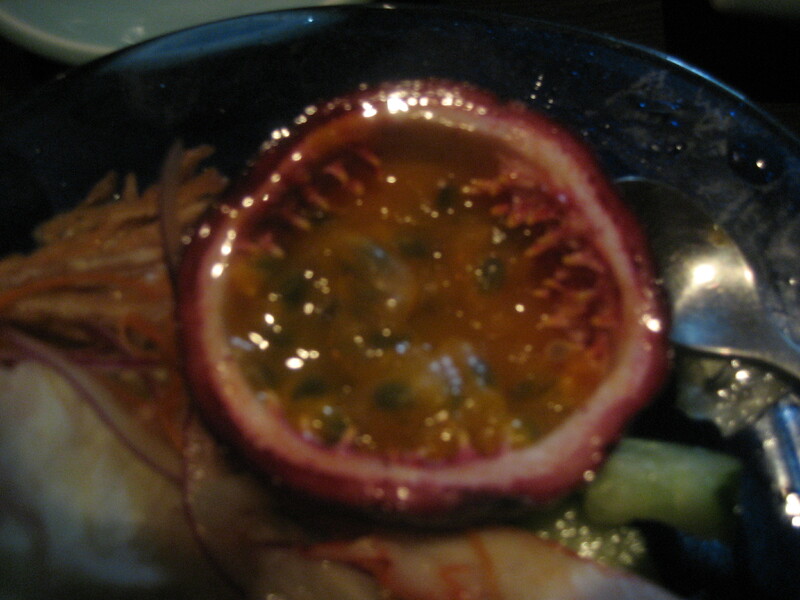 In contrast, a tart prickly pear passionfruit, which was served as part of a Japanese kaiseki meal I had, was also eaten with a spoon and the seeds were snappy and popped like pomegranate seeds. 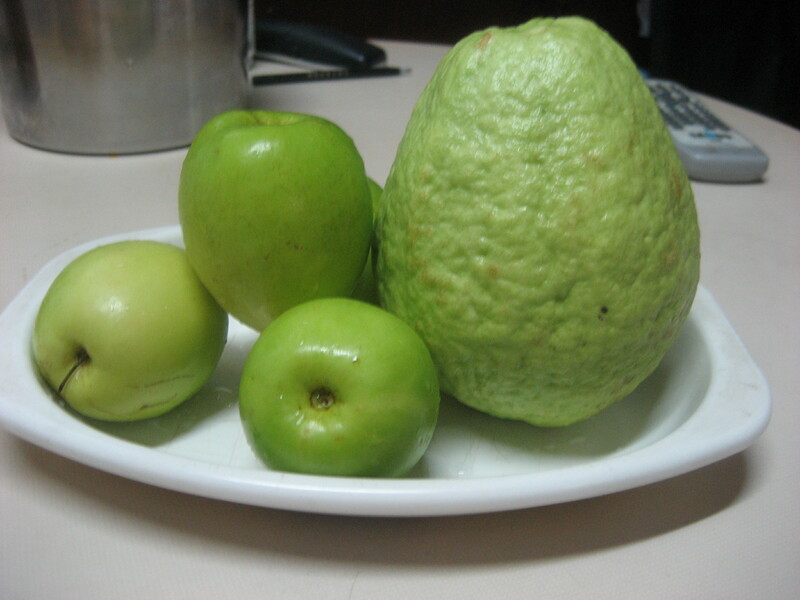 I also had a lot of guava, which was crisp and not as sweet as the canned juice we have in America. I’d been introduced to regular small jujubes last year, but this was the first time I’d seen giant jujubes, which were not as sweet as the smaller variety but had the same texture, like a firm apple. 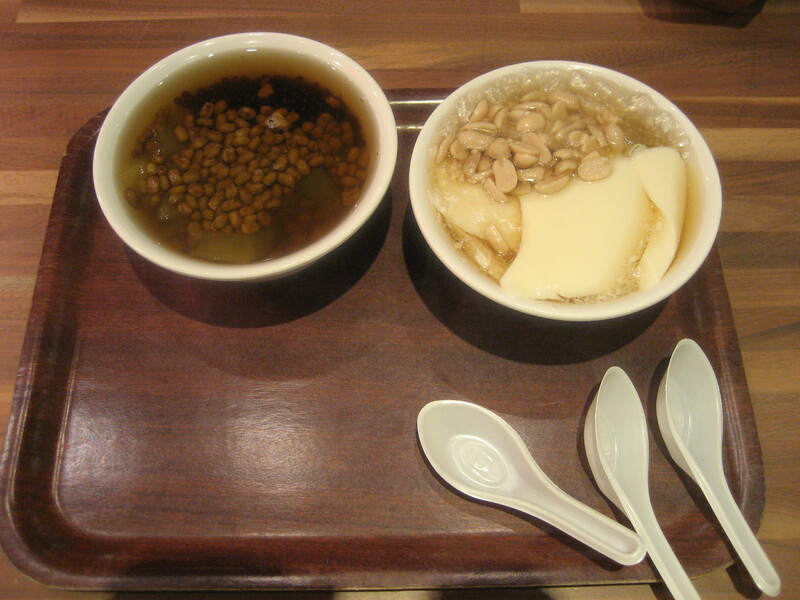 My eating trip began with a very traditional dessert, peanut soup, in the food court at Eslite Xinyi, a huge bookstore/department store chain with some branches open 24 hours. (Imagine if Borders and Bloomingdale’s mated and the baby stayed up all night.) 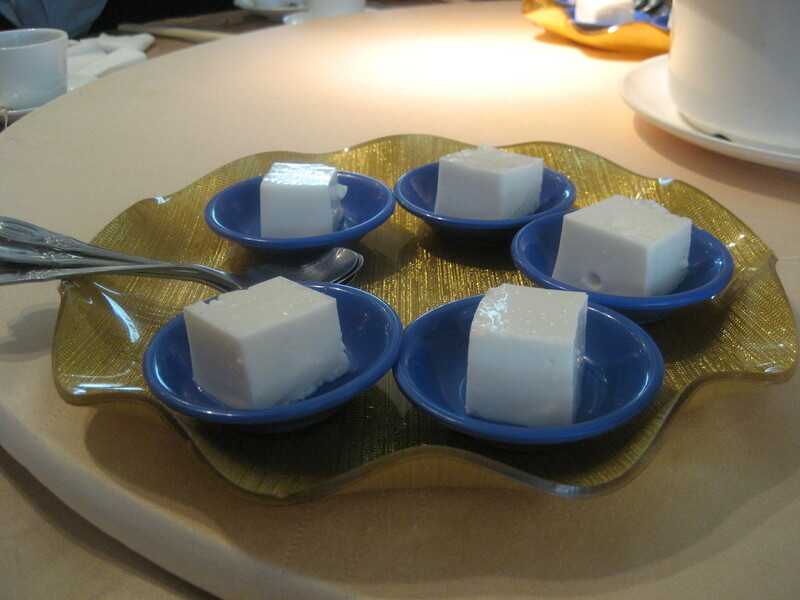 The one on the left is a warm version, and the one on the right is served over ice with doufu hua (literally, tofu flower), a very soft, sweet dessert tofu. 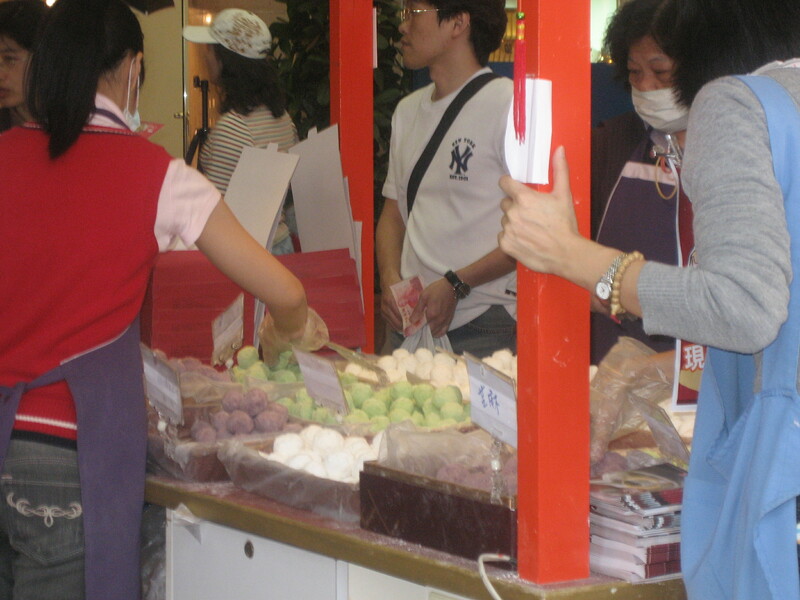 While in Taipei, I ate other desserts familiar to anyone who has been in Chinatown. 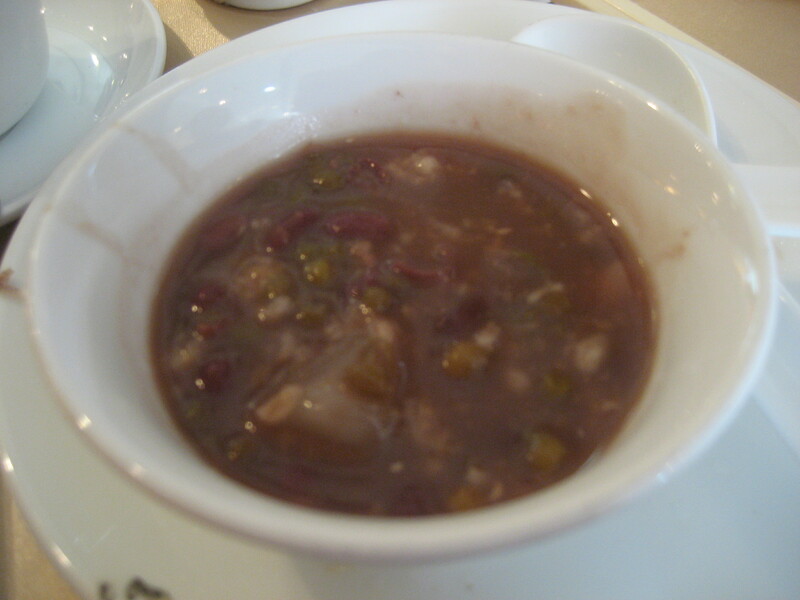 Red bean soup, the usual post-prandial sweet. A deep fried glutinous rice and red bean thing rolled in sesame. 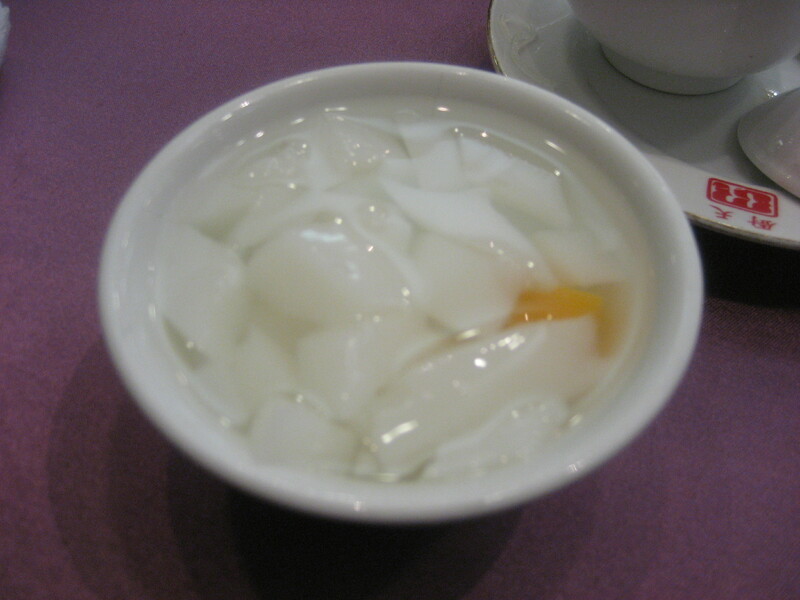 A variety of puddings and jellos, coconut being my favorite. 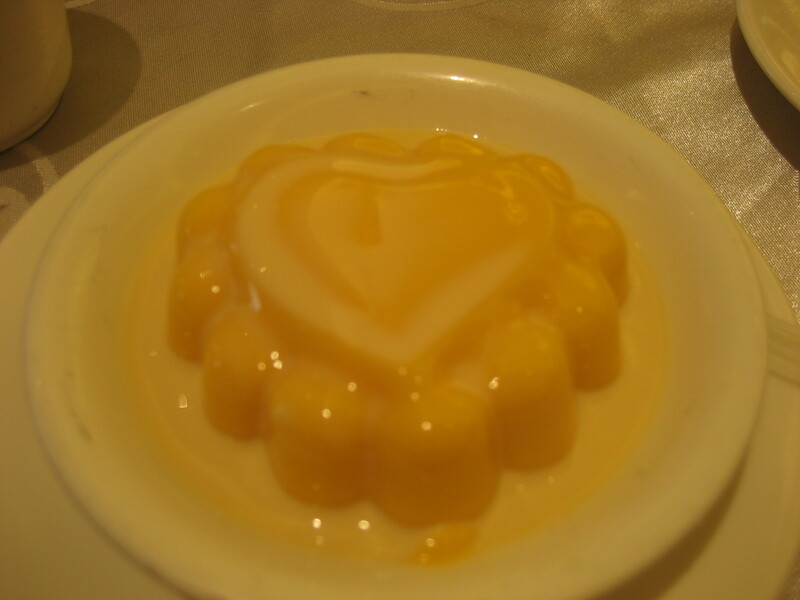 Some of the desserts I had were not particularly traditional in the sense that they did not exist in the Taiwan of my parents and grandparents, but they have become part of the Taiwanese vernacular. It’s strawberry season in Taiwan, and everywhere I went, markets had fresh strawberries. 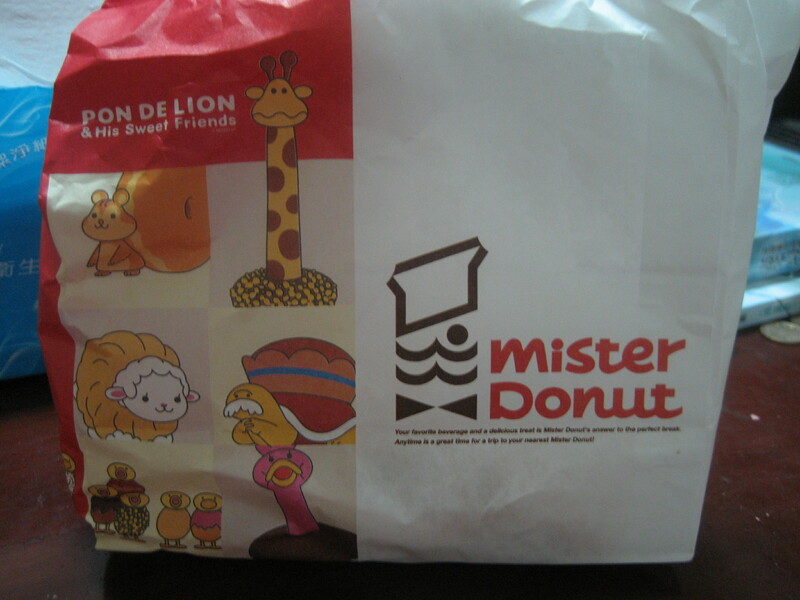 The Mister Donut chain was running a promotion of strawberry doughnuts. 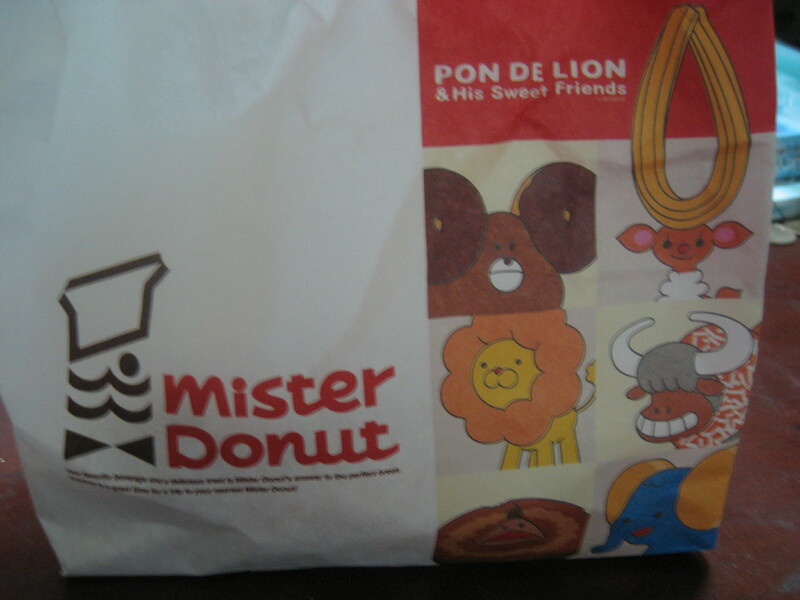 Pon are their standard ring doughnuts, which look like a bracelet of doughnut holes. I bit these open so that I could photograph the insides. 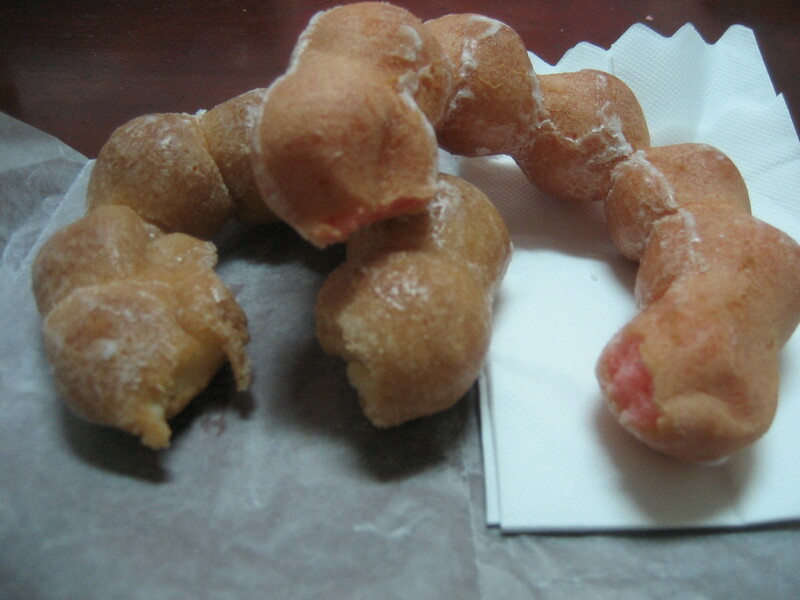 The one on the bottom is plain glazed, the pink one on top is strawberry. The doughnuts in Asia are different—much lighter in the belly and of course with flavors like matcha and red bean. (McDonald’s sometimes has fried pies with red bean and pineapple in addition to the usual apple pie.) Someone even told me that Dunkin’ Donuts products have half the sugar in Taiwan because the American versions are too sweet. 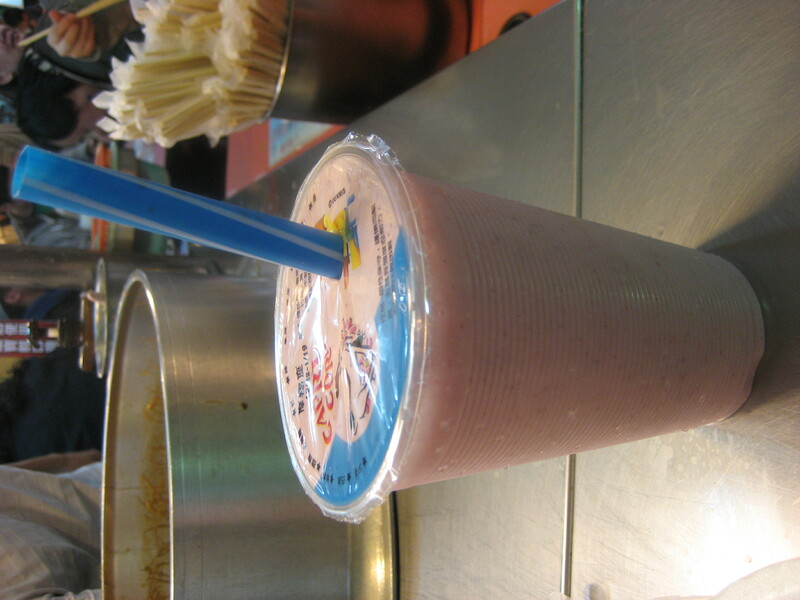 One Taiwanese sweet that is known almost globally is bubble tea (or milk tea to me, since I always get it without the tapioca pearls—small round things, you know.) Though I decry the extra plastic bag they give to protect your hand from the condensation, it’s admittedly convenient to dangle your bubble tea from your wrist while noshing on your skewers of fried squid and chicken. 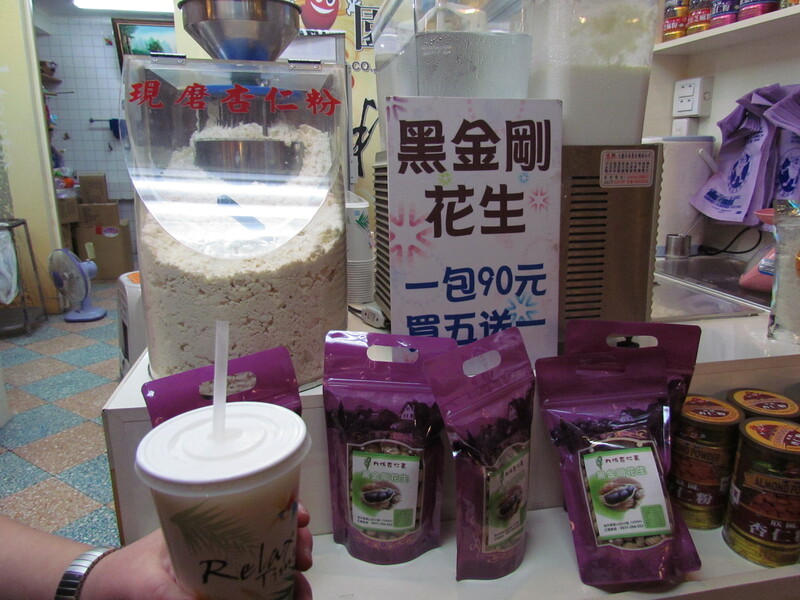 People in Taiwan are very particular about bubble tea. Despite plenty of stands in Shida Night Market proper, my cousin insisted that we walk five blocks outside to her preferred shop. If you get annoyed by people ordering a grande soy mocha half-caf skim latte with walking room is picky, you’ll definitely be bothered by regular orders for such specifics as 70% sugar, 50% ice bubble tea! I’m not a very adventurous bubble tea drinker. Because I read Chinese too slowly to look at all the choices, my go-to flavors are almond and coconut, which appear on all menus. On this trip, I ventured into strawberry milk and pudding milk territories, but I think I’ll stick with almond and coconut. The strawberry was fresh but otherwise unmemorable, and the pudding was inadequately sweet—although it was streaked with chocolate, it wasn’t chocolaty enough (a common problem with Asian “chocolate” desserts—it’s not chocolate, it’s just brown) and the pulled through the thick straw, the pudding was the consistency of snot. 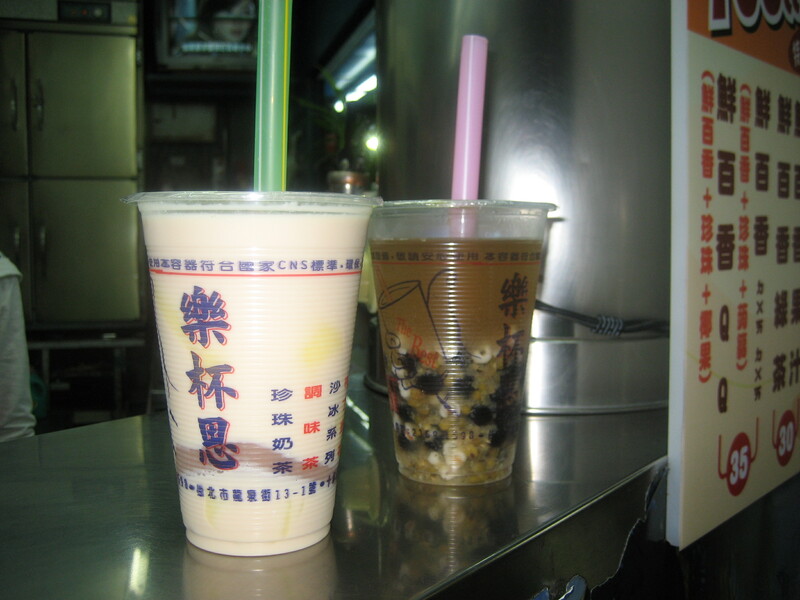 I didn’t even think of trying the milk tea with “frog eggs” (mixed bubbles, cubes of lemon and grass jelly)! More to come about celebratory desserts in a future post. 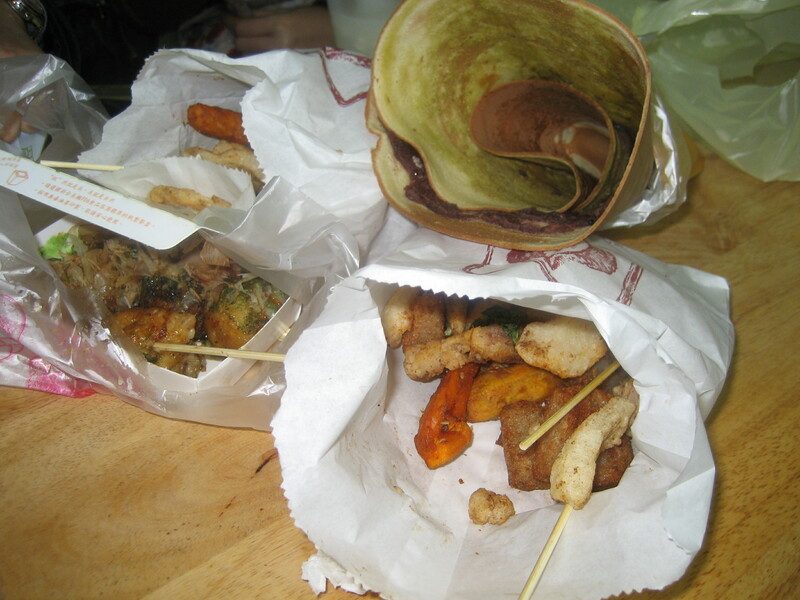 Prior to going to Taipei, I read a lot of things defining night markets as places to get traditional Taiwanese snacks. For me, the term “snack” conjures images of chips or granola bars, not this nightly lollapalooza of steaming vats and sizzling grills that appear all over the city in predetermined spots around 4PM each evening. In a whole culture of “small eats”, it’s easy to make a meal of a few items eaten with chopsticks or sharp bamboo skewers. Shilin Night Market, near where my father grew up, is one of the largest night markets in Taipei and it was particularly crammed this Saturday, being the first warm day and last weekend night of a rainy Lunar New Year holiday. Oysters (Oa, pronounced oh-ah, in Taiwanese) are plentiful. This night market classic is Oa Misua, lots of oysters and some slices of pig intestine with fine rice noodles in a vinegary and garlicky broth with an extra dollop of minced garlic added right before serving. 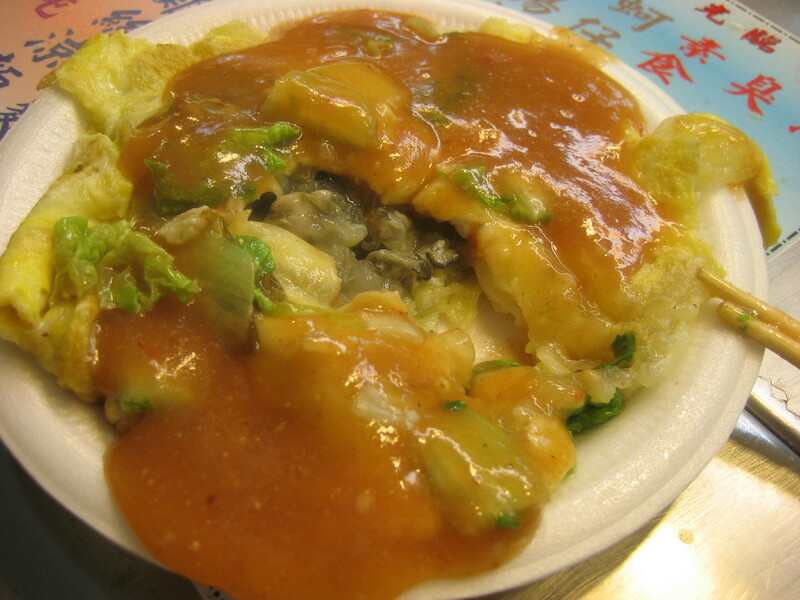 This is Oa Jian, sometimes described as an oyster pancake or omelette, smothered in a salty, tangy sauce. 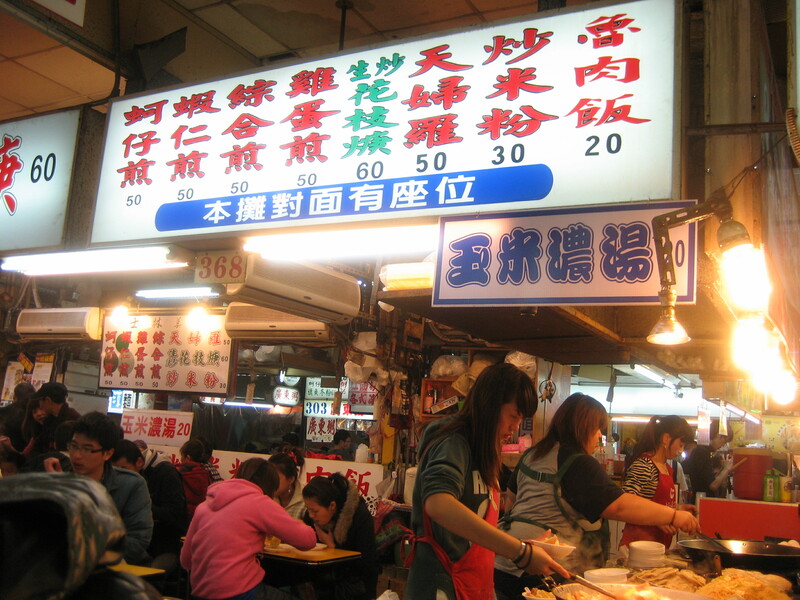 One of the few bad things about night markets is that it’s sometimes hard to find seating. Fortunately, it seems to be acceptable to eat “outside food” as long as you purchase something at the establishment where you’re seated. 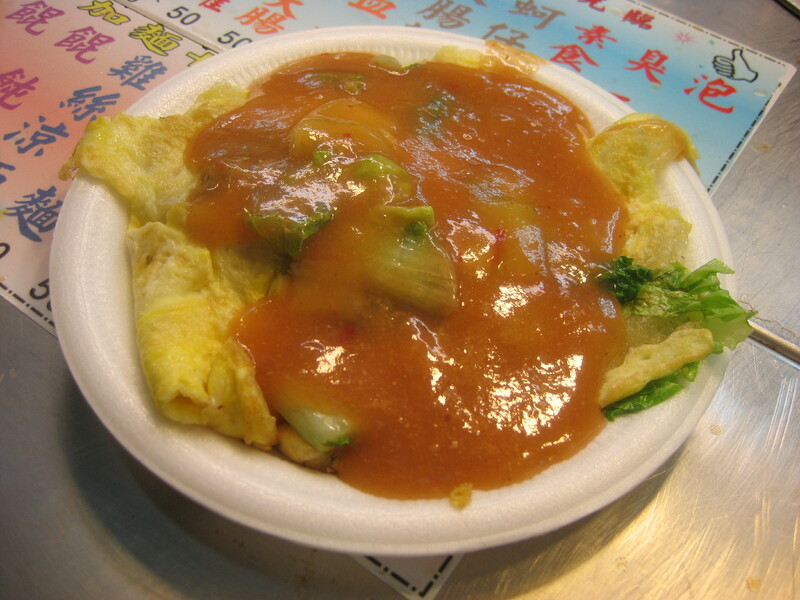 Also, if you want a dish from a nearby stand, the proprietors will gladly yell out your order to the neighbors and fetch it so that you don’t have to leave your hard-won seat. Another problem is the trash. 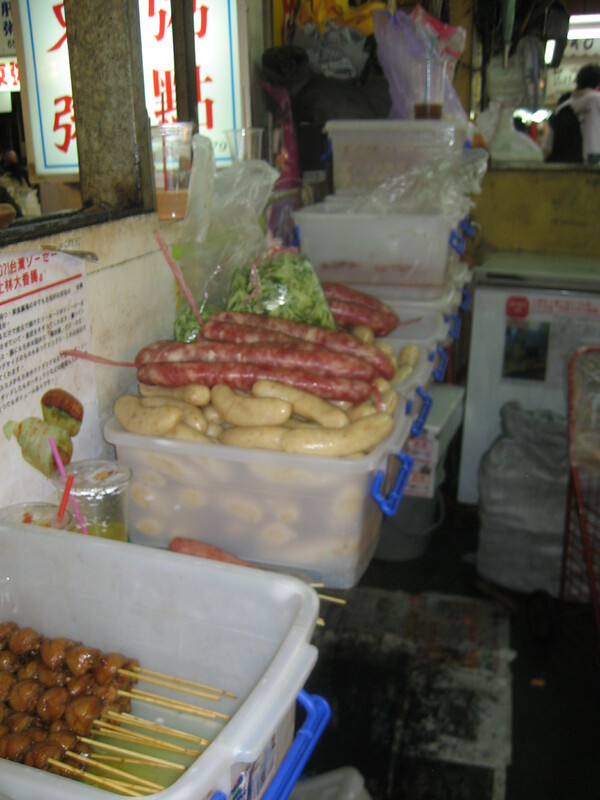 Taiwan is pretty good about recycling and waste management, but the skewers and chopstick wrappers, plastic spoons, bowls, and bags have got to add up, night after night. I don’t know what the solution might be. Corn or soy-based biodegradable containers? A concept dear to my Illinois heart, but maybe not as feasible for a small island whose main crops seem to be betel nuts and sugarcane. Bringing your own containers would probably be against health codes, but bringing your own chopsticks and forks might be a start. 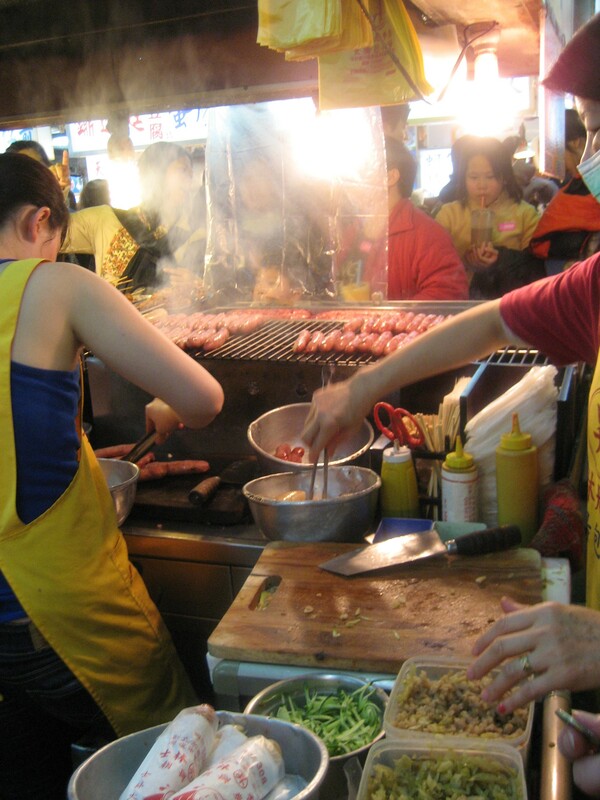 The last thing I ate at the Shilin Night Market was a sausage wrapped in sticky rice. Usually, it’s wrapped in a wax paper bag for eating out of hand, but we had ours sliced for sharing. 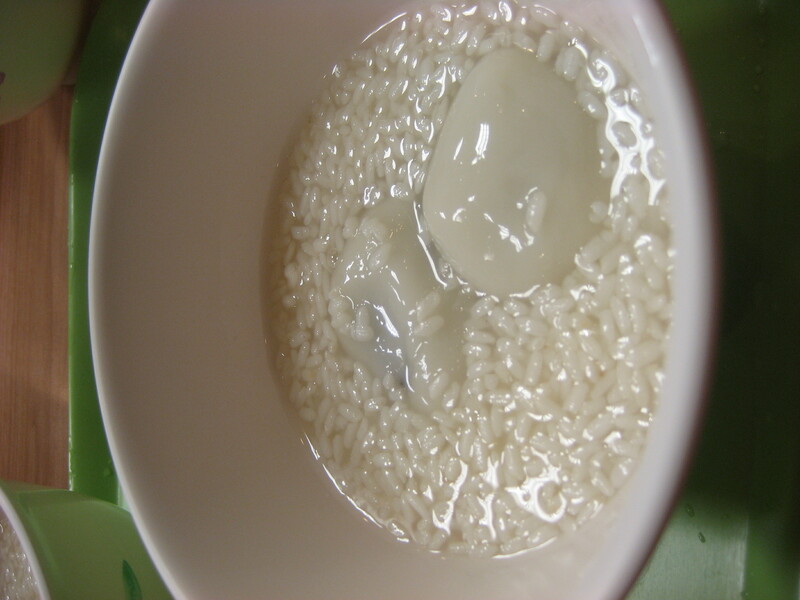 I’m starting to see that “wrapped in sticky rice” is quickly becoming a theme for my eating in Taiwan. I’m told that here in Taiwan, Yong He Soymilk Magnate is what returning overseas Taiwanese insist on between landing at Tongyuan Airport and going to sleep off the 18+ hour flight. No matter how late your flight gets in, Yong He is open 24 hours a day (as are many establishments in Asia) for you to get your fried dough and soymilk fix. 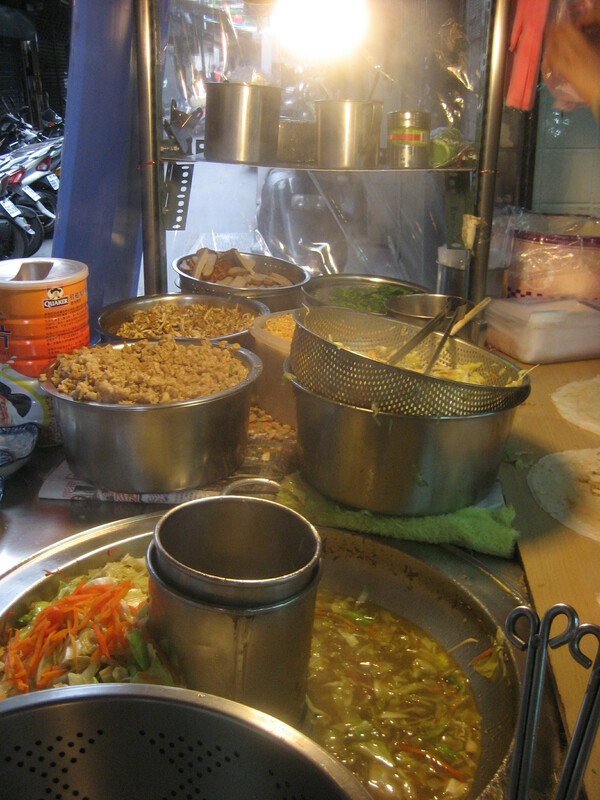 The food is prepared just outside the restaurant so that pedestrians can grab-and-go for less than one US dollar per item. 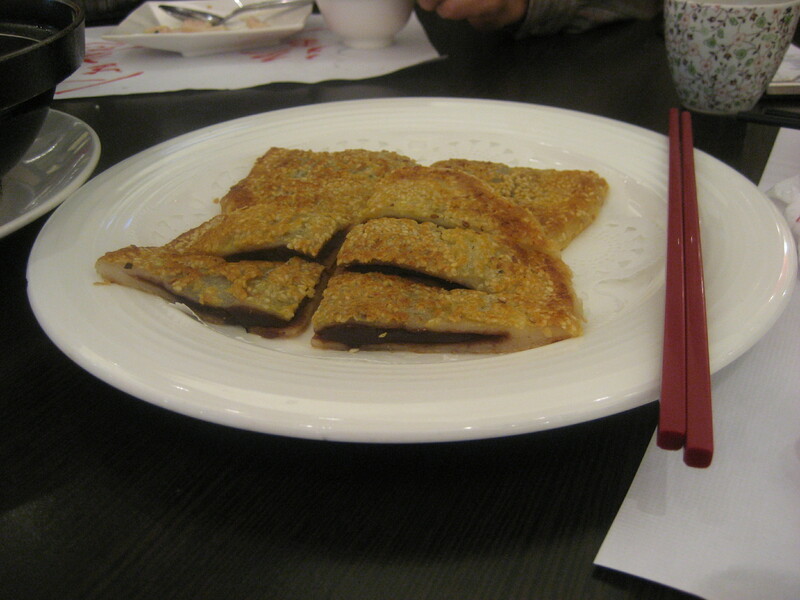 This is a turnip pancake fried in egg. 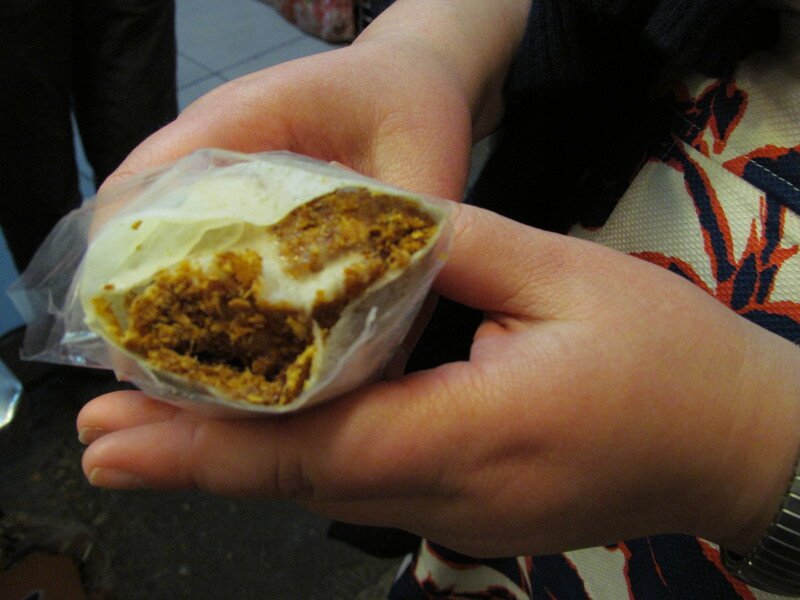 This is a fried dough stick and dried pork tightly wrapped in sticky rice. 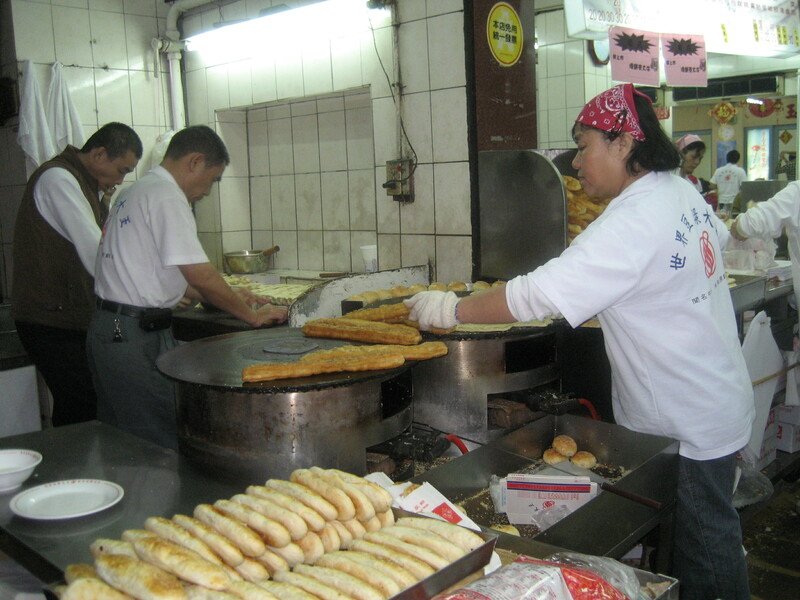 The quintessential Chinese breakfast is a fried dough stick wrapped in a sesame-encrusted, very flaky bread. One of my American quirks that people in Asia always comment on is my need to have a cold drink with every meal. I was thirsty, so I had two cold, sweet soybean milks. 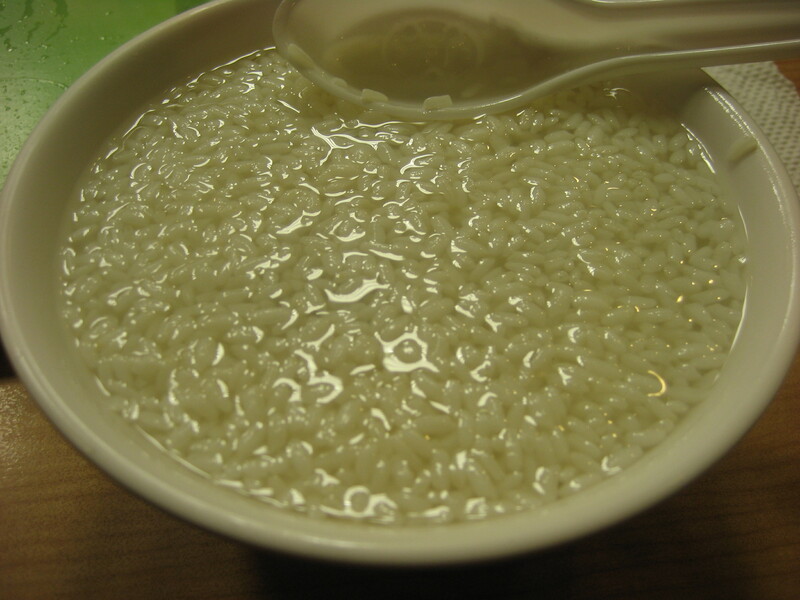 Hot soymilk is served in a bowl and can either be sweetened or savory. 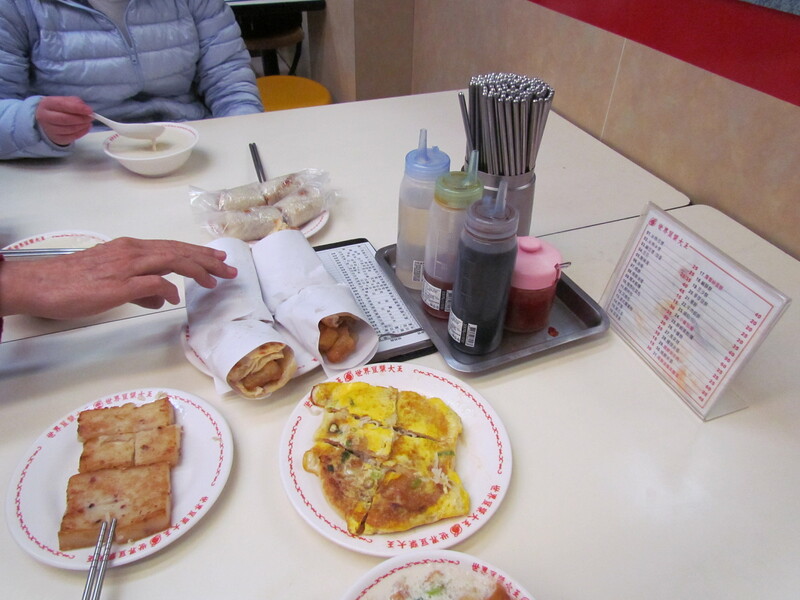 An excellent way to start eating my way around Taipei. I also guess that this means that I should think about what food means “home” to me. Sharon is a good food friend because she blithely ignores socially acceptable conventions on what and when to eat. She will gladly eat five meals a day, or seek out fried chicken and cheesesteaks for breakfast. Although she refuses to eat small round things (peas, lentils, tobiko, chickpeas, etc.) and eats really, really slowly, she is a consistently strong eater. Sharon lives in New Haven, CT where she eats clam and bacon pizza, hot buttered lobster rolls, and steamed hamburgers. What would your food bio say?